Wayne is a master of a number of styles of music including old-time, bluegrass, folk, Appalachian, cowboy, pioneer, railroad, gospel and music of the Civil War. As a solo performer living in Asheville, North Carolina, he plays clawhammer and bluegrass banjo, fiddle, mandolin and guitar. His repertoire is over one thousand songs. A typical program would include songs, stories, history and humor mixed with hot instrumentals. Wayne can design an educational musical program perfectly suited to the occasion and the audience. If your festival, party, wedding celebration or conference is looking for a larger group, Wayne often performs with additional musicians as a duet, trio, or four-piece bluegrass or old-time band. He can also play for old-time dances and provide a dance caller. Wayne has performed at colleges, coffee houses, concert halls, historic societies, museums, clubs, and festivals both in America and in western Europe. He has recorded eighteen solo CDs and written twenty-nine instruction and song books. Wayne has appeared on Sesame Street and his music has been selected to be distributed by NPR’s Wireless Catalog. Many of Wayne’s recordings have been included on numerous educational interactive CDs including American Heritage’s CD of the Civil War and Microsoft’s Encarta 2004. He has won numerous prizes at fiddler’s conventions including 1st place clawhammer banjo (Galax, Virginia, 1973) and 1st place senior old-time fiddler (Fiddler’s Grove, NC 2004). Wayne is included in North Carolina Touring Arts Directory. The Wayne Erbsen Band, from Asheville, North Carolina, showcases their powerful, soulful singing and fiery instrumentals. 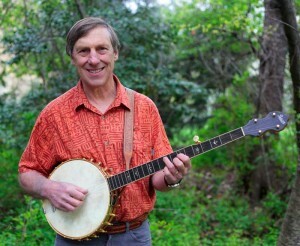 Playing bluegrass and clawhammer banjo, guitar, fiddle and mandolin is Wayne Erbsen himself. Dana Ward is featured on lead and harmony vocals and rhythm guitar. Dudley Wilson sings harmony and lead vocals and plays the doghouse bass.This band is perfect to play for your wedding celebration, party, or other festive events.